You can set rules to automatically redirect your message sent to you to another user. This will help you if you want to redirect the message to another account you use, or if you want another user. 1. Access WorldPosta webmail (mail.worldposta.com) then enter your username and password provided by your IT personnel. the icon to view the menu. (A) From the dropdown menu, select Apply to all messages. (C) Click on Select people… then choose the user or the account you want to redirect messages to. 5. When you finish, click Save. – A copy of messages that you set to redirect to redirect to another account will remain in your mailbox. – If you add an action to delete the message, the message will go to the Deleted items folder. 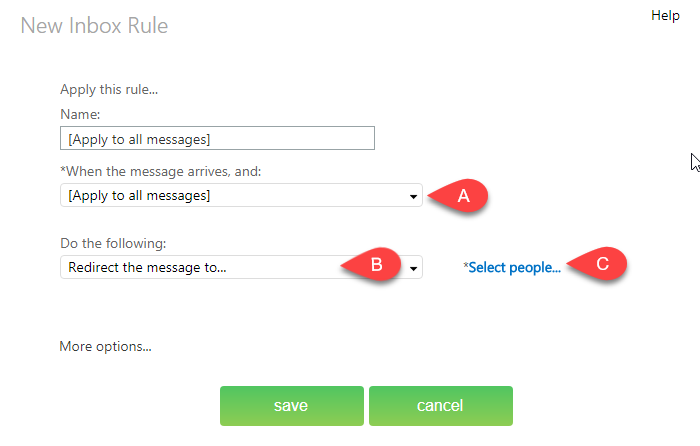 – If you don’t want this rule to apply to all messages, choose any option other than Apply to all messages.